Three words and seven letters on the cover particularly stand out, at least in terms of color. Not to worry, otherwise everything is in order – well, more or less everything. 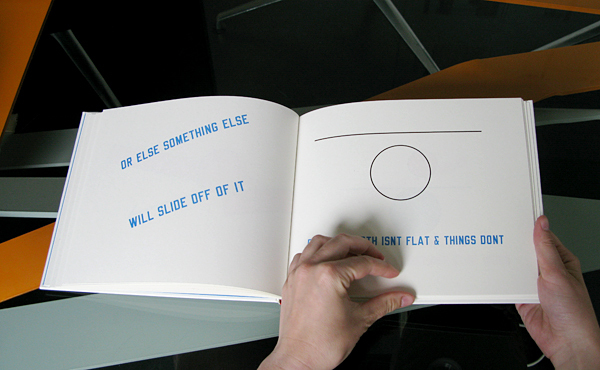 For when the American artist Lawrence Weiner, who was born in 1942 in the Bronx, New York, gives attention to something, he activates our power of imagination and addresses people’s relationships to objects. 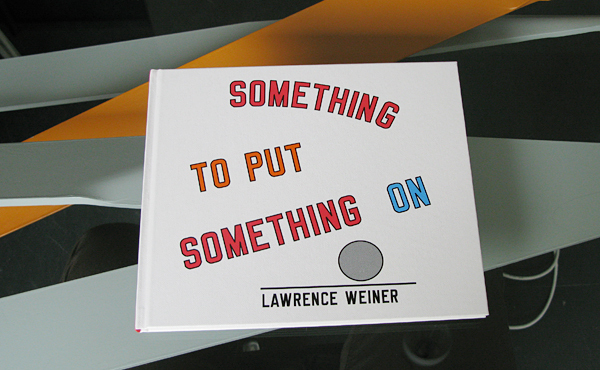 “Something to put something on” is the name of Weiner’s book, published by Steidl Verlag, which vividly shows his way of using language and at the same time proves that things are not quite as simple as they seem. 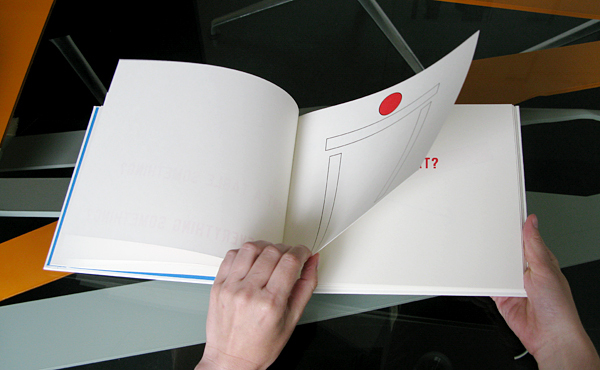 The book starts with a red dot surrounded by a thin black line in the middle of the page. 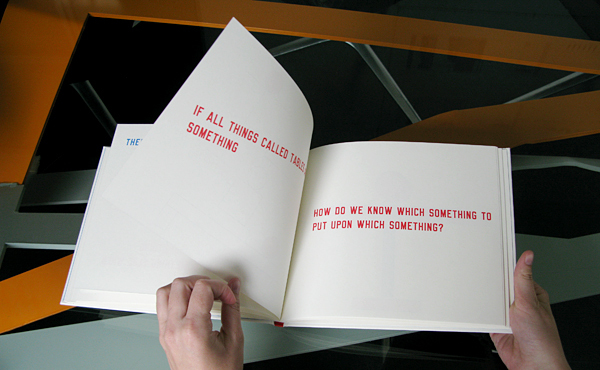 Next to it we read, in blue uppercase letters, “There is something I want to show to you.” Underneath, in red letters, “How shall I know what it is?” And that’s it, we are transfixed. The language defies quick consumption. 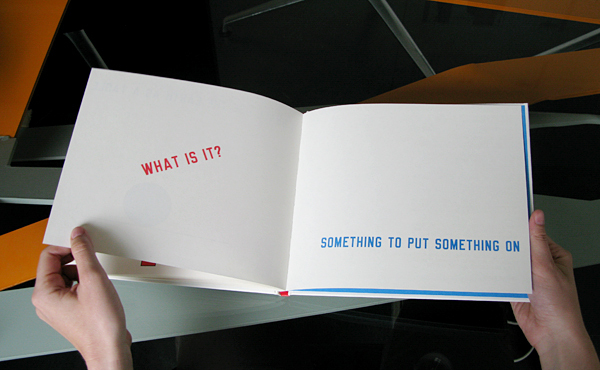 Someone obviously wants to show us something – and yet only shows us the sentence which this promises. And then he does not even know what he wants to show us. 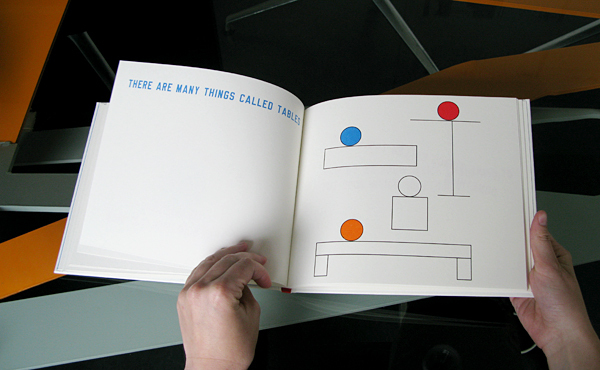 Or is it perhaps a dialog, a conversation between blue and red? 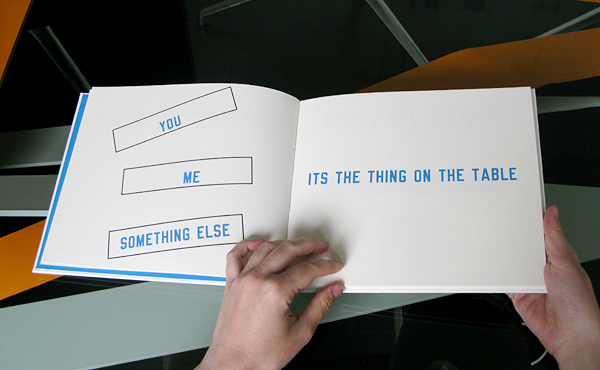 Be it “you”, “me” or “something or other”, it is staring us in the face – it’s the thing on the table. 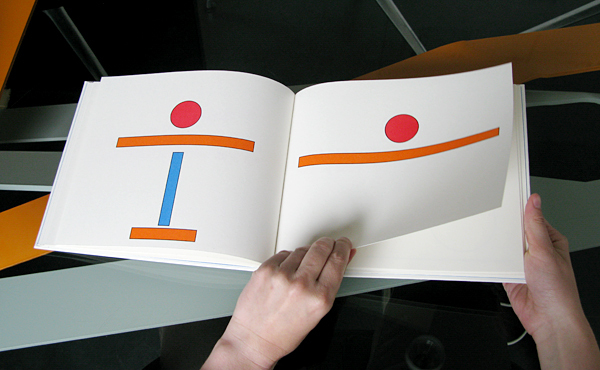 The project initially started as a practice piece ten years ago, whereby the book was intended primarily for young readers. 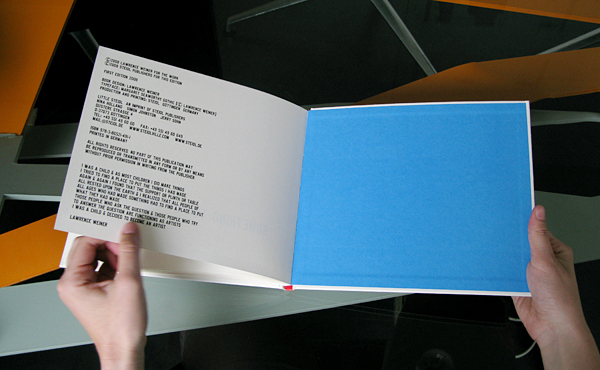 However, there is no pigeonholing it in the usual manner anyway, for it is both an artist’s book and a children’s book. 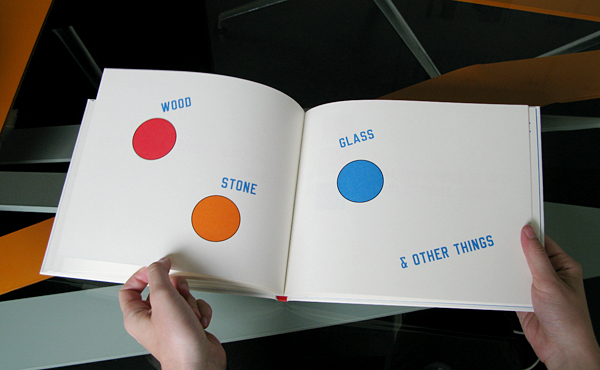 Yet above all it asks philosophical questions and steers our thoughts in new directions using red, blue and orange sentences, by asking us about our relationship to objects. That which fascinates the artist above all else, as he puts it himself, is man and the dignity of an object. 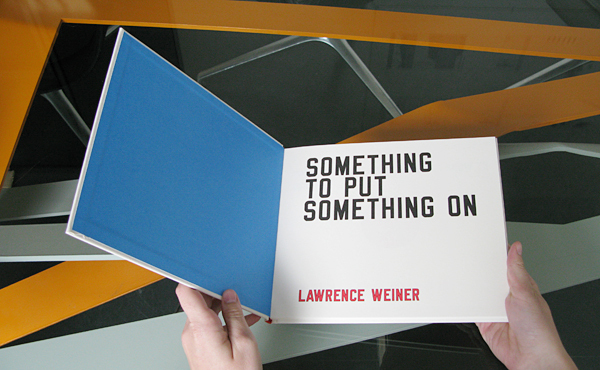 Although Weiner is often described as an important representative of 1960s Concept Art, it is precisely not just a pure concept which is important in his language-based sculptures. 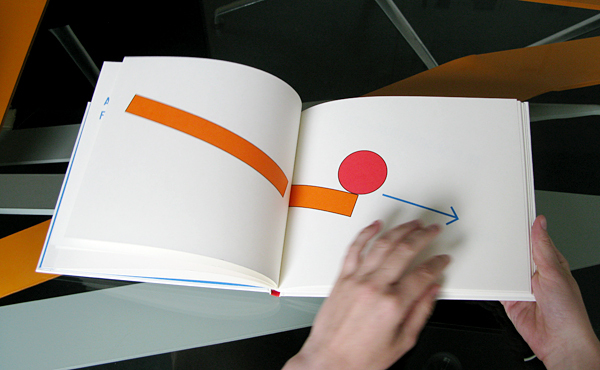 Weiner not only tailors a semantic but also a visual dress for the words and in this way makes Concept Art, often vilified as a dry art of ideas, vivid and pleasurable. He is extremely open to processes and accordingly one of his repeatedly rephrased versions of his “Declaration of Intent” of 1969 states that, “1. 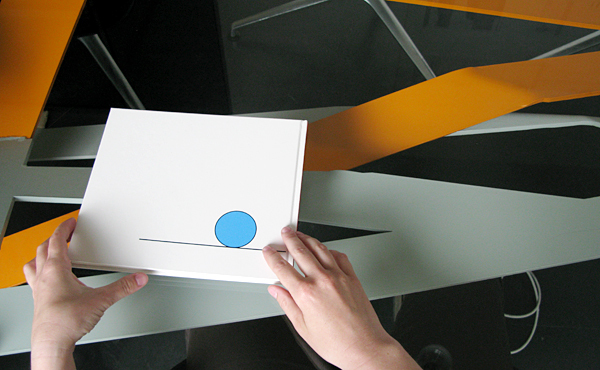 The artist may construct the piece - 2. The piece may be fabricated - 3. The piece need not be built.” All being equal and consistent with the intent of the artist. The decision as to the conditions rests with the receiver in the act of receiving. 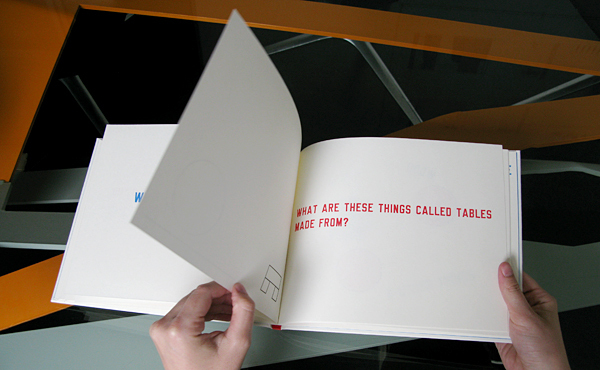 It is not only metaphorically that something appears on the table, but also physically. Here something is activated, triggered, after all, “to put something on” also means “to set something in motion,” “to orchestrate something.” And suddenly everything revolves around the table, what it is and if it is something, just as though we were Plato’s guests, who had decided after much hesitation to give his thoughts a new form. 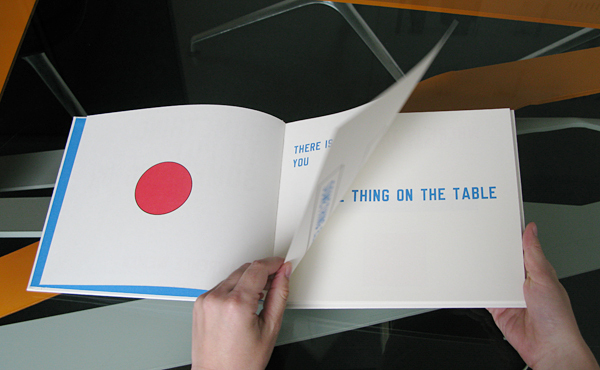 And suddenly the red dot bounces on the table – or does it slide off the table? 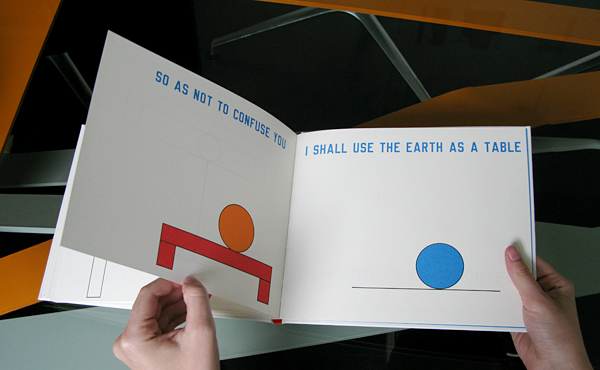 Yet, as the artist argues, the world is indeed not flat and things do not slide off it? Right? 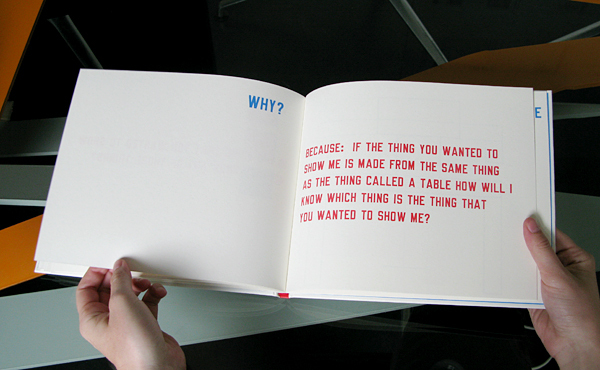 It continues on searchingly in this way, colorfully, with questions such as this: How can you show someone something if the thing you want to show him is no different from the thing on which or in front of which you want to show it to him? 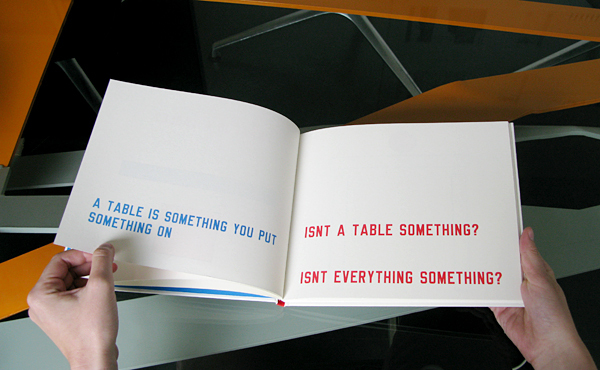 So, if the table and the thing…but not to worry, Lawrence Weiner has an original solution ready which I will naturally not give away. Weiner works with how he perceives something, what he thinks about something, how concrete materials behave toward each other. 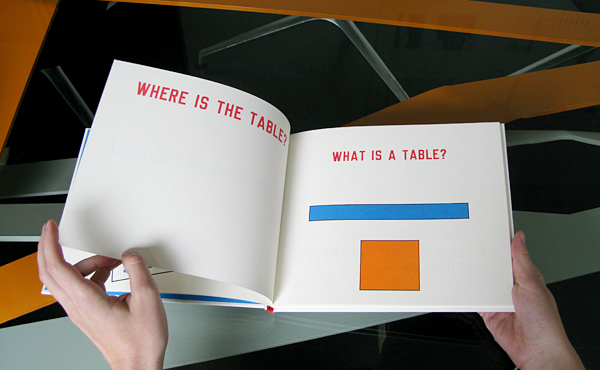 And all at once the sentences and questions he presents to us in colored lettering and structured with brackets, frames and lines tempt us into the land of imagination. “I wish,” he says, “that society had to find a strategy to deal with what I make, instead of the artist always having to find a strategy to deal with society. I am just as much part of society as everyone else.” Indeed, you have to pick something out, show it, present it or orchestrate it to move something forward.